Take 2 kilo grams of water and add 100 grams of honey to it and then boil the mixture. This water-honey mixture will last for 4 days, after, which you can prepare another similar mixture using the same proportion. Daily about 250 grams of the water-honey mixture has to be taken on any empty stomach, before taking the morning tea or coffee. Then, on Saturday, you have to dig a 1 foot deep hole in the ground and take water in a Lotta and do an Utara of yourself 5 times by rotating the Pani Ka Lotta in a clockwise manner around your own body. Then, you have to bury the Water jug in the hole in the ground. The Utara ritual has to be performed on all the Saturday, which fall during the 40 days period for which the remedy has to be practiced. 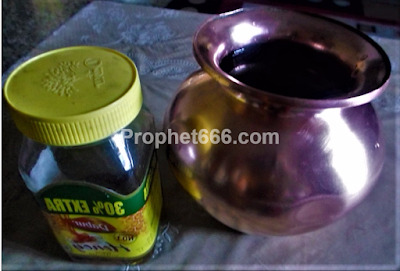 This concludes the remedy, which is called as the Motapa Kam Karne Ka Totka in the Hindi language. While practicing this remedy you have to take meals twice a day at approximately the same timings daily. Fried food and food-stuff should be avoided. Do we continue with the saturday uttara if we are in our monthly periods during these 40 days sir? Do we continue with the Saturday uttara if we are in our monthly periods during these 40 days please reply as I desperately need to try this. Thank you. Sorry forgot to ask you, do we have to cover the pitta with a lid or something and then cover it in the ground? Coz if we just put the mud it will get inside the pitta.. I hope I made sense. Please reply to both my queries above. Thank you.